45. 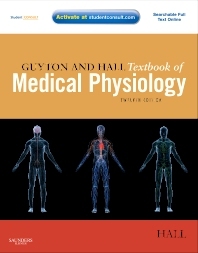 Organization of the nervous system, basic functions of synapses, "Transmitter substances"
The 12th edition of Guyton and Hall Textbook of Medical Physiology continues this bestselling title's long tradition as one of the world's favorite physiology textbooks. The immense success of this book is due to its description of complex physiologic principles in language that is easy to read and understand. Now with an improved color art program, thorough updates reflecting today's medicine and science, and accessible online at studentconsult.com, this textbook is an excellent source for mastering essential human physiology knowledge. Learn and remember vital concepts easily thanks to short, easy-to-read, masterfully edited chapters and a user-friendly full-color design. See core concepts applied to real-life situations with clinical vignettes throughout the text.